Be your own advocate & educate yourself. Do you have special dietary needs? 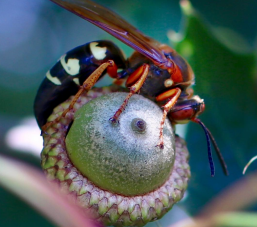 This insect seems pretty happy with an acorn but most people wouldn’t be. Everyone is unique and has their own needs. Unfortunately you cannot put those requirements into the hands of others – even “experts”. In the past month I’ve had a “nutritionist” try to serve me a food I was severely allergic too and then say, “oh sorry” (in a very offhandedly manner) when I caught the mistake. Another “nutritionist” tried to serve me foods multiple times that I had severe intolerances too. In the same month a “trained product expert” tried to sell me a product with milk in it. I had specifically said I absolutely cannot have milk. He assured me there was no milk. Right on the package it said “this product contains milk.” And just last night I was served some desert that four people, including the chef, assured me there was no milk in. My body disagreed so later I did more research and found out there was indeed milk in it. This was in just one month. I’ve also seen similar things happen at the hospital with nursing staff and the nutritionist there. The bottom line is that “professionals” are not being trained properly in what allergies and food intolerances are and “experts” often give incorrect information or makes mistakes. Shockingly, the attitude is often “this person is being picky” rather than “this person has a legitimate medical need”. If you are unable to check labels and advocate for yourself be sure to designate someone to do that for you. Become your own expert and your own advocate – it can make the difference between life and death for some or the difference between health and severe illness for others.